All went according to plan, and Harris returned to school on Wednesday. In fact, he perked up several hours after he returned home. If you have to have a surgery, this is the one to have. 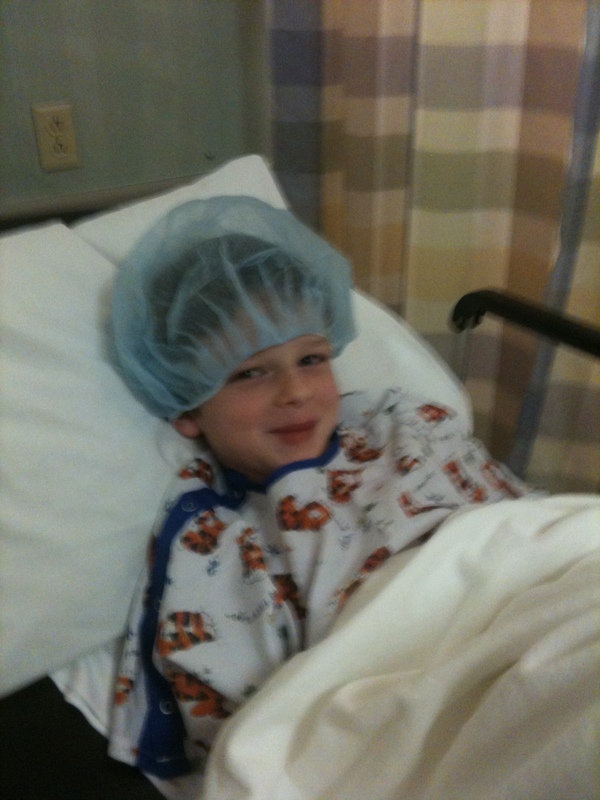 Harris is all smiles before his procedure. As a parent, though, I couldn’t quite compute “minor.” I knew and tried not to worry about the risks of sedating a child. It is a slight risk, but there is still a possibility of complications. This tiny chance that something could go wrong wreaked havoc with my emotions all weekend, culminating in a palpable sense of dread Monday morning. Harris, who’s 6, seemed at peace with it all, not really looking forward to it but certainly not dreading it. He had already been through this once several years ago. He had tubes put in his ears when his hearing problem first surfaced during a routine screening at his pre-school. I spent my Monday morning as I spend most mornings: rising at 4:30, praying, reading, writing, and working out. I dispatched Carla and Harris to the outpatient surgical center at 7:15, armed with a list of chores to take my mind off things. The surgery was scheduled for 9 a.m., and I looked at my watch constantly throughout the morning as I emptied the dish washer, loaded the washing machine and fixed breakfast for Harris’ brothers. I am not a worrier. Carla can probably recite my lecture on the dangers of “What if?” thinking. “Let’s try not to worry until we have something to worry about,” I frequently say. If traditional gender roles can be trusted at all, she is supposed to be the one who worries. It’s OK for her to fret about the one-in-a-million chance that something will go wrong with a minor surgery. I’m supposed to stay calm. So I did what I think a lot of men do – what my dad probably did when he was worried about his boys: I transferred. I took those feelings of fear and being out of control and focused them on cleaning, straightening, laundering. I had spent the weekend leading up to the surgery working with the boys on their Pinewood Derby cars, getting so worked up over each minor set back. It finally occurred to me on Monday morning that I had been worried about Harris. Trying to keep your emotions in check is draining. The relief I felt when I got Carla’s text, and when Harris, still groggy, came in and laid down on the couch restored my equilibrium. During the adenoidectomy, an emergency toothectomy had to be performed. But, I’m sorry to say, there was a complication. After the anesthesia kicked in, the doctor discovered that one of his top front teeth was extremely loose. 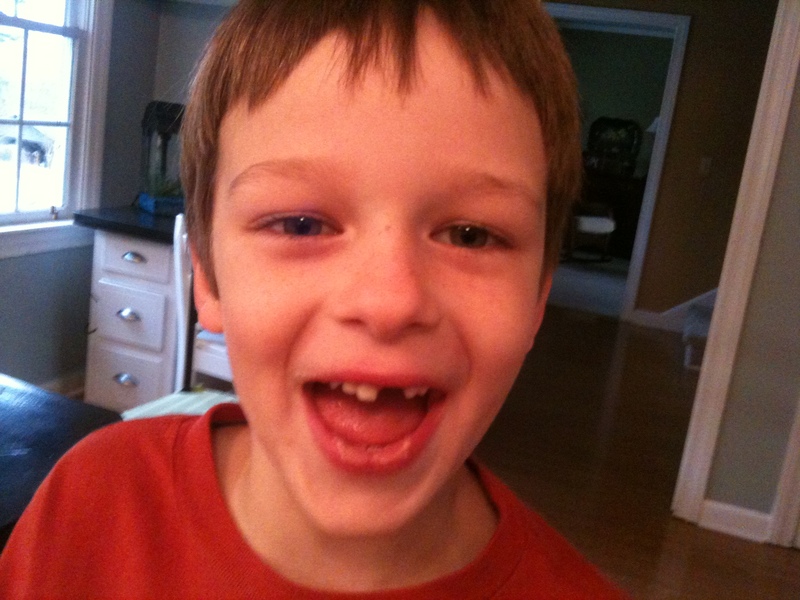 So when Harris woke up, he had a new, lisp-inducing gap in the front of his mouth. He just laughed at himself, and entertained his brothers who kept calling out “s” words from him to say. Now that this tiny interruption in our lives is behind us, I can say that the minor surgery accomplished more than helping Harris breathe and removing the pressure on his ear drums. It prepared me, even if only a little, to face with my kids days that have larger consequences. It was practice for the major stuff. Minor surgeries. Sometimes our hearts don’t know the difference. This entry was posted in Uncategorized and tagged adenoidectomy, adenoids, anxiety, anxious parent, contemporary South, front teeth, Harris, Lance Elliott Wallace, Lance Wallace, loose tooth, losing teeth, minor surgery, New South, New South Essays, NewSouth, parenting, South, Southern, Southern Culture, Southern Living, Southerners, surgery, the South, worry. Bookmark the permalink.